Sometimes you want to display both the Date and the Time in a Generic Inquiry column. 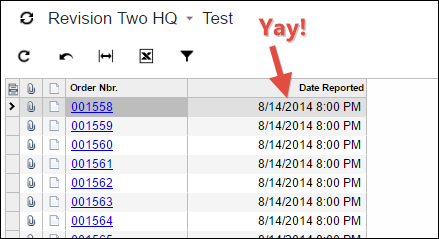 Use this Acumatica Generic Inquiry Date and Time trick to do it. I learned a cool trick recently when it comes to getting a column to display both the Date and the Time in a generic inquiry. I create a simple Generic Inquiry like this. The problem is that I only see the Date (not the Time) in the second column when I run it. In order to get the Time to display, we can use a trick by adding the CRCase table without any relationships like this. Then we put CRCase.CreatedDateTime in the Schema Field column of our already existing row. We’re basically “hijacking” the format from CRCase.CreatedDateTime and using it to get the format that we want on our SOOrder.CreatedDateTime field. Now the column shows both the Date and the Time. 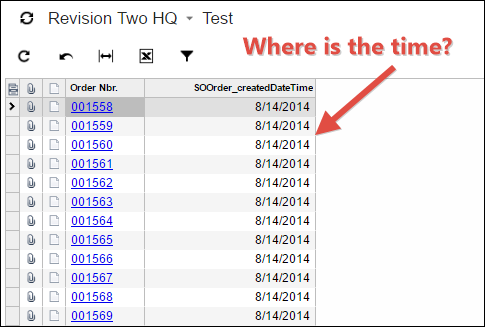 The only problem left is that it took the column title from CRCase.CreatedDateTime and gave the column an incorrect name of Date Reported, but we can fix this by overriding the caption on the Generic Inquiry. 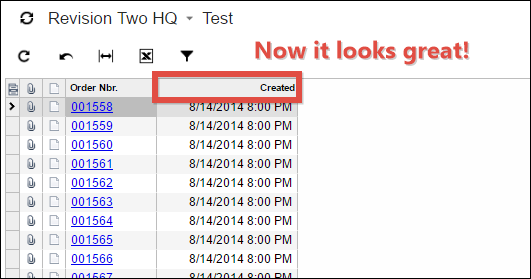 You might have to add the Caption column to your grid using the icon to the left of the paper clip in the grid.